The drone is suitable for all ages and experience levels. With pop guards on it is nearly indestructible. The FQ777-124 is very affordable. The coolest benefit to this drone is the ability to charge your drone without an external power source. Great compact remote transmitter to store the drone. The drone is a much better indoor flyer due to its relatively small size. It fits in your pocket. The quality of the storage container feels a little “cheap”. The drone is difficult to control even in light breezes due to its small size. The controller might feel awkward to pilots who are used to more traditional transmitters. It emits high frequency noise. The success of the hugely popular Cheerson CX-10 still resounds. It is no surprise that more and more Chinese drone makers are looking to rival the cult quadcopter drone with new competition every now and then. The FQ777-124 by FUQI is the latest of this lot and is by far one of the more unique mini drone models on the market today. Besides being a super small quadcopter drone, it also does something more: it fits right inside its own controller, which is very cool, and also extremely handy. You’ve always wanted to fit your Cheerson CX-10 in your pocket. However, the thought of broken props always made you change your mind. Not anymore! Normally, RC drones are charged by hooking them up to an external power source (car/wall chargers, USB chargers for laptops, etc. ), but The FQ777 absorbs power from a specialized storage box that also doubles as a transmitter. This means that the controller is not only used to fly the drone, but it’s also where you put the drone away to charge and for this reason, the FQ777 can be flown anywhere and anytime. This drone looks like the perfect present for drone beginners and/or for office entertainment. Amazing Range: The FQ777-124 Pocket Drone has maximum range of around 50 meters and generally, most $20 drones aren’t capable of such a far remote distance. Quick Charging Time: The FQ777-124 has an average charging time of about 30 to 40 minutes. 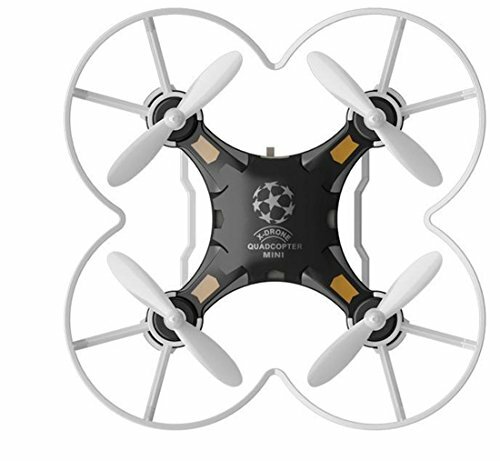 This means that it recharges faster than other RC drones of similar weight, size, and battery type. Portability: This pocket drone features portable charging station. This means that the FQ777-124 can be charged at the beach, at parks, or anywhere else where there isn’t access to an outlet. There are many small quadcopters on the market that are sold very well because they are accessible to everyone, but this tiny FQ777-124 quad has the most creative design of them and I think that will be a best seller this summer. The drone’s storage/charging case also serves as the transmitter, as mentioned earlier in the review. The smartest thing on FQ777-124 is the remote controller. The transmitter has two compartments with transparent doors. The door in the front is dedicated to store the FQ777-124 Pocket Drone and the other one for the accessories (protection frame, spare propellers and landing skids). The transmitter can also be used to charge the drone’s battery, which can be very useful when you are out in the nature without any power socket. Luckily, the transmitter isn’t setup any differently than what you would find in other transmitters: the right analog stick controls your ability to move side-to-side and back-to-front, while the left analog stick controls ascents/descents and yaw rate. The package also includes a hand strap that can be attached to the transmitter. This feature is very useful if you don’t want to carry the transmitter in your pocket. You can also program the controller to operate on one of two flight modes: conservative or aggressive. The FQ777-124 Pocket Drone is extremely light (about 12 grams). This means that when it’s in the air, you’ll be able to manoeuvre it with ease. Unfortunately, you shouldn’t expect to get much performance out of it when flying in moderate to heavy winds due to its small size. For outdoor flights I recommend only days with gentle wind. Also, it was very hard to find the drone in 10cm high grass so be careful where you land. Indoors, the drone handles like a champ. It offers smooth, agile, and quick flights. The drone is equipped with a small capacity 100mAh Li-Po battery, which allows about 5 minutes of flight time. The battery takes about 30 to 40 minutes to completely charge. Also, the flight speed can be set between two values: Low and High. The FQ777-124 has all the latest features of the bigger drones, like heedless mode one key return to home, which sounds incredible. These features make it easier for users to control the drone. Of course you can’t expect too much accuracy when you push the return to home button. However, you probably don’t need it anyway with 20-40 meters of flight range. You’ll be less likely to lose or break propellers when you crash thanks to the drone’s prop guards. The great thing about these prop guards is that they are removable. This is a huge benefit for newbies since they will definitely be doing your fair share of crashing! “Yaw Rate” refers to how quickly a drone is able to spin right or left on a horizontal axis, and the FQ777’s yaw rate was much faster than the Cheerson CX-10s’, but not quite as fast as the Eachine H8s’. Overall, the FQ777-124 has the potential to fly fast and aggressively. On the other hand, the drone can also be flown conservatively to save battery. The FQ777-124 Pocket Drone is perfect for those who are looking for a fun, inexpensive, and unique drone that’s perfect for all experience levels. What’s amazing about this drone is that its transmitter serves as both a charging station and storage container, which is something that you definitely don’t see a lot of in the drone market. To top things off, it only costs about $22 and simply for the fact that this drone’s storage case serves as its controller and charging station is enough to justify the price tag. The drone might not have the best flight time out there. However, it offers precise handling and descent range. The spare parts, such as the 8 spare propeller and the propeller protector, is also a big plus, particularly for beginner pilots. The FQ777-124 looks like the perfect present for beginners as well for yourself and it will help you have some relaxing moments even in your office. Newbies and advanced pilots can definitely have a lot of fun with this drone.